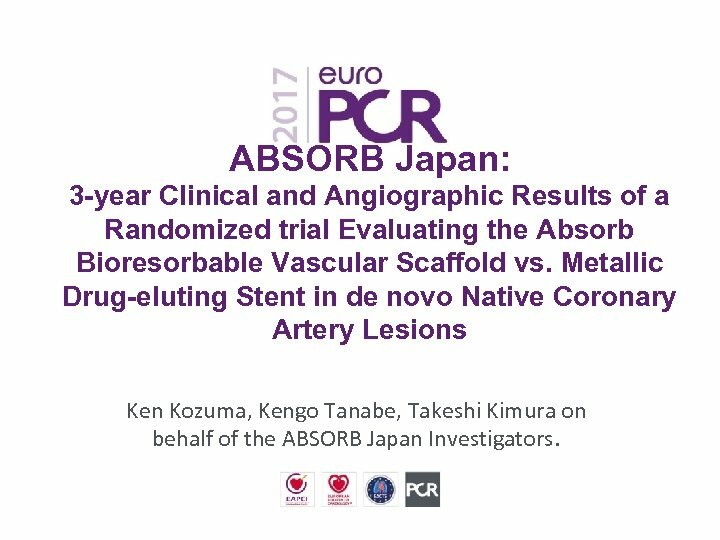 ABSORB Japan: 3 -year Clinical and Angiographic Results of a Randomized trial Evaluating the Absorb Bioresorbable Vascular Scaffold vs. Metallic Drug-eluting Stent in de novo Native Coronary Artery Lesions Ken Kozuma, Kengo Tanabe, Takeshi Kimura on behalf of the ABSORB Japan Investigators. Relevance of the trial • • • The 2 -year results of Absorb III and Absorb Japan showed a relatively high incidence of TLF in Absorb compared to XIENCE. 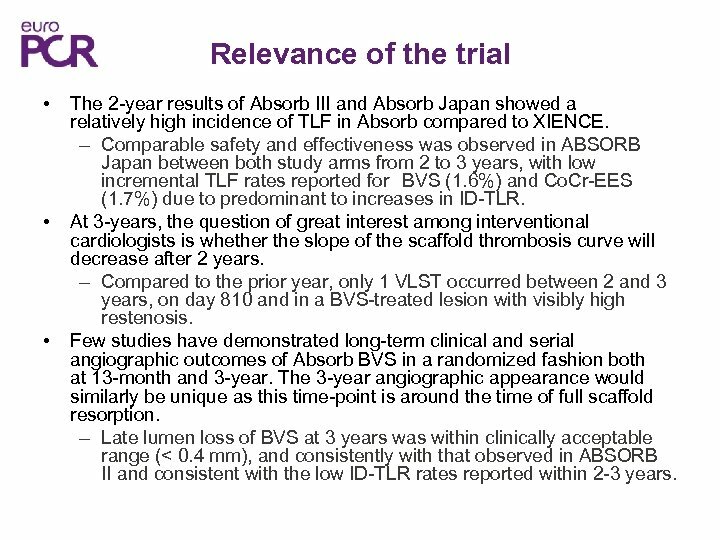 – Comparable safety and effectiveness was observed in ABSORB Japan between both study arms from 2 to 3 years, with low incremental TLF rates reported for BVS (1. 6%) and Co. Cr-EES (1. 7%) due to predominant to increases in ID-TLR. At 3 -years, the question of great interest among interventional cardiologists is whether the slope of the scaffold thrombosis curve will decrease after 2 years. 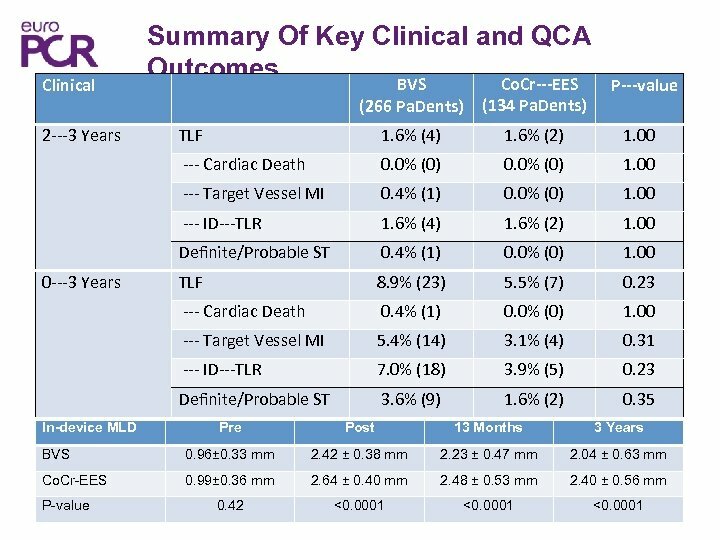 – Compared to the prior year, only 1 VLST occurred between 2 and 3 years, on day 810 and in a BVS-treated lesion with visibly high restenosis. 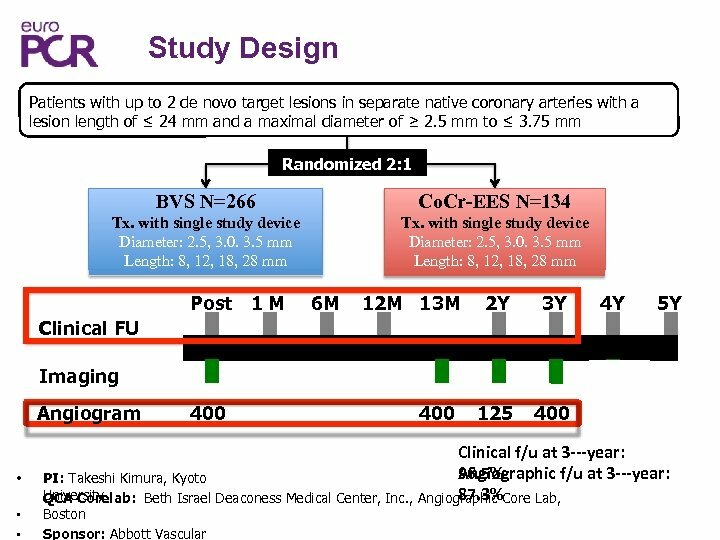 Few studies have demonstrated long-term clinical and serial angiographic outcomes of Absorb BVS in a randomized fashion both at 13 -month and 3 -year. The 3 -year angiographic appearance would similarly be unique as this time-point is around the time of full scaffold resorption. – Late lumen loss of BVS at 3 years was within clinically acceptable range (< 0. 4 mm), and consistently with that observed in ABSORB II and consistent with the low ID-TLR rates reported within 2 -3 years.